You must make reservations at least 5 minutes in advance of the time at Maria's Taverna. Welcome to Marias Taverna a family owned and operated restaurant, where great food and good times come together. 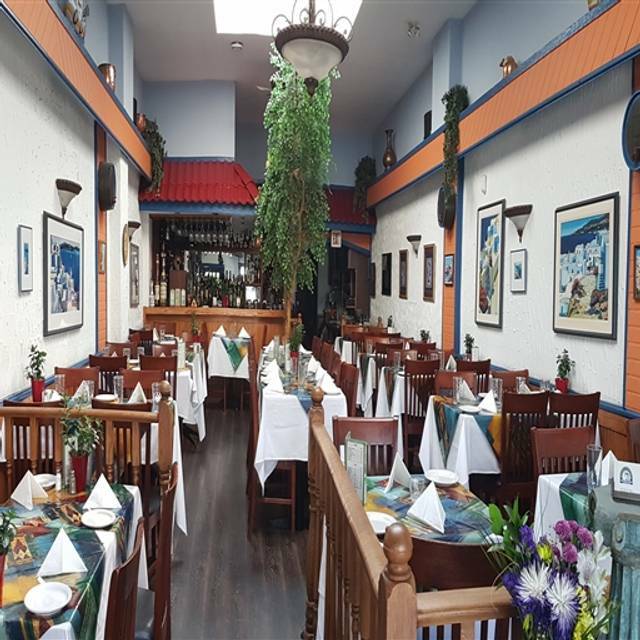 Located in the heart of Kitsilano, Vancouver our Restaurant offers Fine Greek Cuisine in a Charming Atmosphere. We Hope to See You Soon! Thank you for a really good celebration of our nephew’s 40th birthday. We especially appreciated that you could accommodate his toddler daughter. The food all around was delicious and the server was so pleasant and efficient. 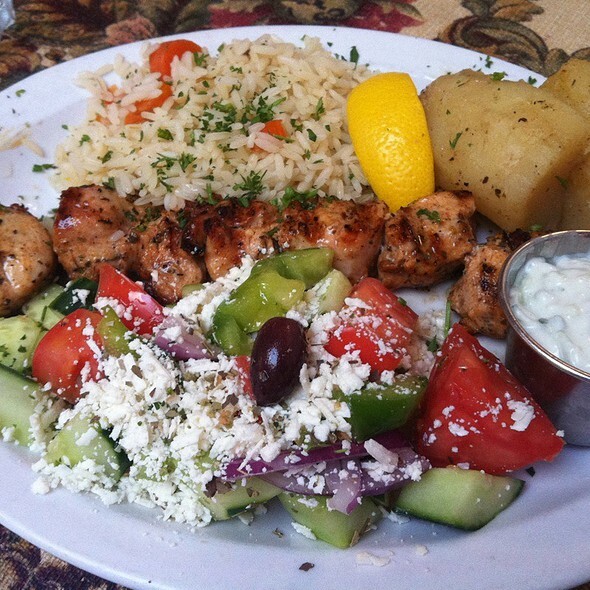 We enjoy treating our adult children to a dinner out, and are particularly fond of Greek food. We have been looking for a new favourite Greek place since our usual restaurant closed. We were happy to find similar dishes, well executed, served promptly by a friendly, attentive server. We appreciated the quiet background music as we enjoy one another’s company and like to chat (not yell) with family members during our meal. We can completely recommend the hot hors d’œuvre platter, calamari skaras, moussaka, and lamb rib meals. 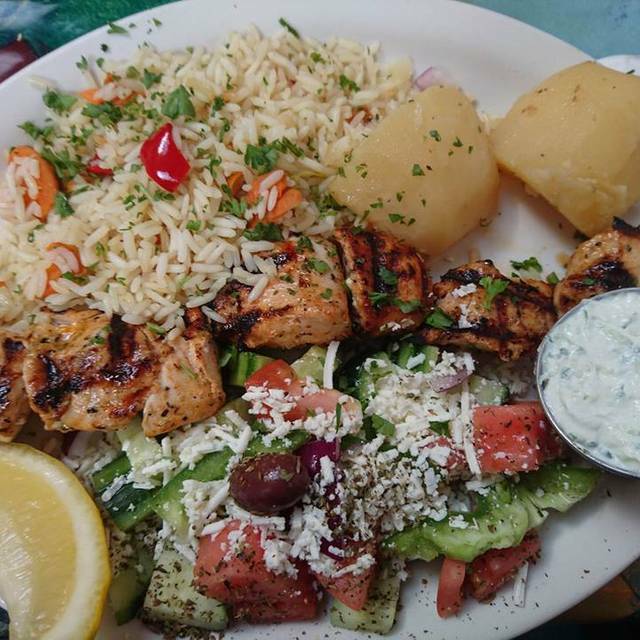 Our search is over; we have found our new Greek restaurant. Maria’s is always a great experience - we will keep going back! Maria’s is always great. Good food, very nice ambience and very comfortable. We will keep going back! Great place! We have been ordering for years and decided to dine in. Awesome food as always and the ambiance was just what we needed. Wrote a very very positive review on February 6th and it never showed up. Am truly PO'd that I would spend my time to give a great review and not have it posted. The restaurant was traditional looking, nice ambience. Service was poor, we were a party of 8, one person was served and we had to wait almost 10 minutes for the rest of the meals, which were delivered 2 at a time over the next 7-8 minutes. Wonderful meal at Maria's ... great service. The staff all worked together a a team, even the owner. The Dine Out meal was delicious. Fun to talk with the other dining patrons ... one group was celebrating a birthday, fabulous place for a party! Thank you to Maria's ... a favourite neighbourhood restaurant. Generous portion of tasty lamb kleftiko; beef Slouvaki also good but a bit too salty for us. I have already recommended Maria's to friends after our dinner outing on Friday night. We will return. We ate here, after getting recommendations from family. We had the dine out menu. We chose the Orso chicken soup, lamb, and baklava. Everything was served in a very timely but friendly manner. We were offered pita bread while waiting for our first course. Overall, the food was very tasty, portion size plenty, in fact I was able to take home a portion size sufficient for lunch the next day. We were very pleased with our food, and service..also a quiet place with nice ambiance. We would highly recommend. It is difficult to find such a good local restaurant....best lamb chops in Vancouver along with numerous other great selections. Service by Bruno was exemplary. A place we could enjoy frequently. Great food and service! Definitely a neighbourhood gem. Service was amazing; efficient yet unobtrusive. Owner very obliging and seems genuinely appreciative of our patronage. The Host was super cool. They put effort in to accommodating us on a busy night. Didn’t feel rushed. Our server was nice and laid back. The interior is really well done. Very glad we decided to eat there. Food was awesome. Great greek food - all the classic dishes. The lamb souvlaki was tender, and there wasn't too much rice. I only had a taste of spinach pie in the appetizer platter, which was very good. I need to go back and try it again. It has been a while since going to Maria's and reminded that it's a great little restaurant. I had the Moussaka and came with potatoes and Greek salad. It was delicious and perfect comfort food for the rainy night that it was. My fellow diners had the chicken souvlaki and baked spaghetti. They do more than just Greek like pizza too. Both liked their meals and ate it all! We also had the grilled garlic shrimp as appie which were just okay. Needed to be grilled I think and more oomph! But all was delicious and would definitely recommend. I've also had the lamb shank here and its sooo good but you need a big appetite for it as there's lots of meat. The restaurant person did not check me in for my points. The food was enjoyed. The Greek food here is consistently the best for many years. We had not been to this restaurant in about 5 years and they apparently have had a change of ownership in the last year or so but we found the food to be every bit as good as it ever was. 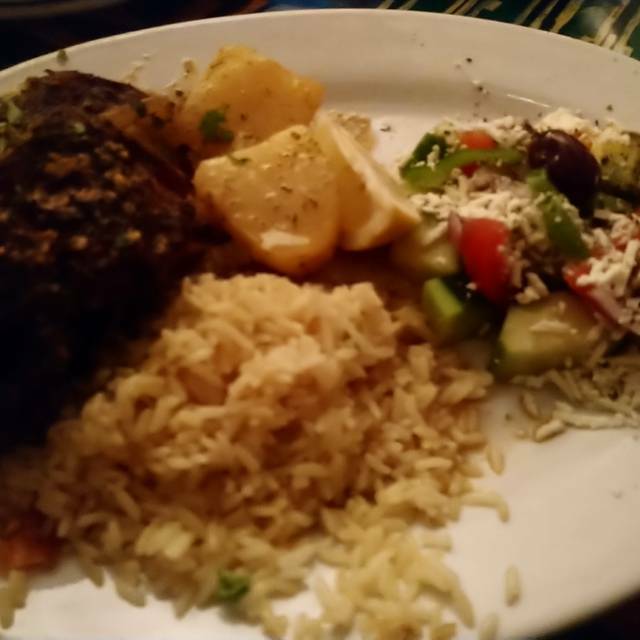 My wife and I both had the Kleftiko and it was superb - the meat was literally falling off the bone and the flavor of that meat was extremely good. I know a funny yes of the word extremely but really it had so much good flavor, was juicy and very tender. We like Greek food and eat at a number of other Greek restaurants in the Vancouver area but this was just better than the rest. The restaurant ambiance can also be very good but on the night we were there it was pretty noisy with lots of kids mind you we were eating there at 6:00 PM so maybe not too surprising. The service was OK but not as good as the food. The overall value is excellent I think. Our family has enjoyed Maria’s Taverna for at least 15 years. It’s winderful. The food is delicious, and the service is impeccable. Since Athenes closed we were looking for a good Greek alternative. This is it. Cramped restaurant was very crowded when we arrived with a large group of 11. Only two servers on duty, which was really only-one-and-a-half, as one appeared to be only doing table setup and clearing. Other server took 20 minutes to even ask if we would like appetizers, then another 20 minutes to take our entree orders, at which time the appetizers had just started to arrive. Server's attitude was cool; never got the impression that she cared whether we were enjoying our experience. Took another 50 minutes to get the entrees (so 90 minutes from when we came in), but they all arrived at the same time, all were hot, and the food overall was very good. But, need more servers on duty during busy times, and better service overall. We booked a reservation for Maria’s Taverna through Open Table. When we arrived, the restaurant had no record of our booking. Even after showing the hostess my phone confirmation, this resulted in a less than adequate table location. I would suggest that you communicate to your partners at Maria’s Taverna, that, they keep better track of their online reservations. We’ve used Open Table before and were very pleased with this service in our past few visits. Horrible service, server got order mixed up, brought wrong orders to the table. Food was average. I’ve been to much better Greek restaurants in Vancouver. Maria’s was a huge disappointment. We shared the Maria’s platter for two with a variety of seafood and meat. It was absolutely delicious. Great ambience, personable service in a warm relaxed atmosphere. Very nice place, with a cozy family atmosphere. We were 2 and ordered a sharing platter: it was huge, I am pretty sure it would have been enough for 4 people. We liked everything, ate a lot and also brought something home. Old school Greek food - very generous portions - in a casual but comfortable setting. Lamb souvlaki was tasty and tender, humous was a hit with us garlic lovers. I had made a Reservation earlier in the day and we were almost told when we arrived there was no room. We mentioned we had made a reservation both online and by phone. I was certainly a bit surprised! There was a large party in at the time, getting all the attention. They did move a couple and make up a table for us. Then we sat there for quiet sometime before we finally decided to ask to get some table service., since we once again had been forgotten. I waved over for some service to one of the young ladies and she then mentioned us to the waiter. The poor waiter who finally arrived to take our orders, looked like he was done for the night. Luckily we enjoyed our meals but I will not be rushing back to celebrate anymore Birthdays, sadly anytime soon. We enjoyed a delicious beef souvlaki meal - the meat was so tender. Service was attentive and overall we had a very nice time. We’ll definitely be coming back! Fantastic as always - great food, atmosphere and service! Maria's never fails to score a perfect TEN. Once you enter the restaurant, you know you are in good hands. Great atmosphere and welcoming staff. Food and wine were amazing, we will definitely be coming back! It was only mid May at 6 pm, and the restaurant was already so unbearably hot as to make us simply want to finish up and leave. Too cheap to install air conditioning? We ordered a calamari appetizer and then a seafood platter, which also has a lot of calamari. Good service would have meant that the server would remind us we were doubling up on calamari and suggest a different appetizer. No wonder there are always tables available in this popular part of town. I will return for a very good Greek dinner - highly recommend. Even better than it was 20 years ago! Excellent food, atmosphere and service. We will definitely go back. We had a really nice dinner for four last Saturday at Maria's Taverna. We were celebrating my son- in- laws birthday and it was a perfect place to do so. The menu offered a broad choice of Greek and Italian dishes and appetizers. Everyone thought their dinner was delicious, from the souvlaki to the lamb shoulder and many choices for pizza. The dining room is attractive and modern and seems perfect for small groups. The whole room seats about 60. The new owner was welcoming everyone and making sure the customers were happy. The servers were great and saw to all our needs.We decided to do another family party here in the summer as we thought Maria's Taverna would be perfect for a big family occasion. They even have a couple of highchairs.